When there's no time to cook it “slow and low,” it's time to reach for your pressure cooker. First the pork shoulder is seasoned with a quick sweet and smoky homemade dry rub made of brown sugar, smoked paprika, garlic powder, onion powder, and mustard powder. Then it is pressure-cooked in beer for moist, tender, flavorful pulled pork. 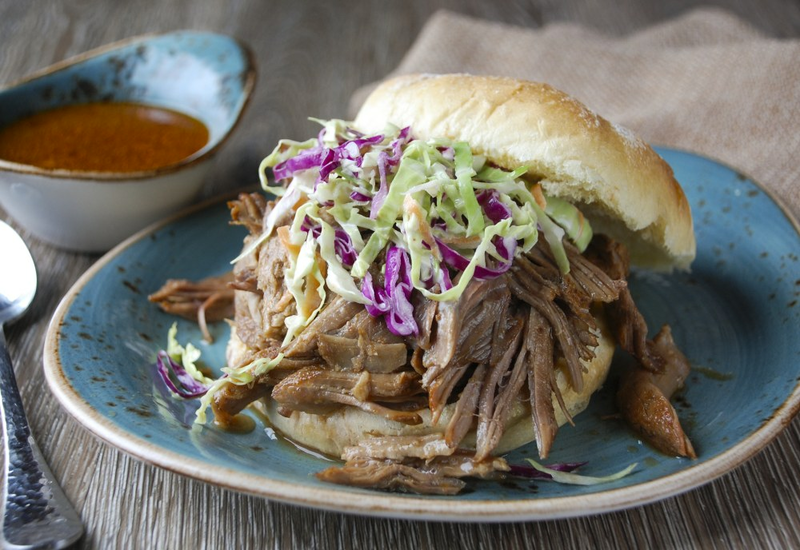 Pile it high on a sturdy buns and top with the simple sweet and tangy slaw included in this recipe. 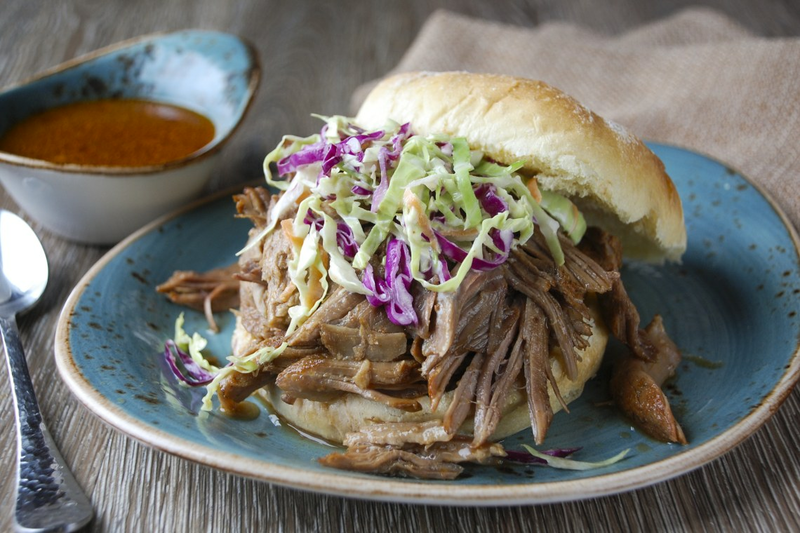 The juices from this pulled pork are so flavorful that you will want to let the shredded pork soak in them for a short while before serving. If you like, you can also serve with your favorite barbecue sauce. Per Serving: 796 calories; 47g fat; 41.2g carbohydrates; 48g protein; 166mg cholesterol; 771mg sodium. I found this recipe while looking for a way to do something different for pulled pork. I usually just do a little Hawaiian sea salt and liquid smoke and am happy with it, but it's nice to mix it up. The seasoning rub, beer, and vinegar all seemed to play together nicely in this recipe. And what I love about using the pressure cooker is not having to handle raw pork at eight in the morning, as I've done when slow cooking. I'm not ready for that when I'm making school lunches and trying to get coffee down my face. The additional liquid plus the fat from the pork can make it a little wetter a pulled pork than you may like. Take some of the liquid out before shredding. You can always pour some back into the pork to get it where you want it! I've made smoked pulled pork dozens of times, but that takes hours! I love that I can now make it in my pressure cooker in just over an hour, without losing its authenticity. The combination of vinegar, beer, and spices, is what enhances the flavor of this meat, you don't even need barbeque sauce. I can't wait to make this again for our college football party! This recipe is so good, you don't need sauce! That's how you know it's great pulled pork. As we say in the south, if it needs sauce you're doing it wrong! Bonus: It takes less than two hours to make. Excellent! Followed recipe completely including coleslaw! Family loved it! 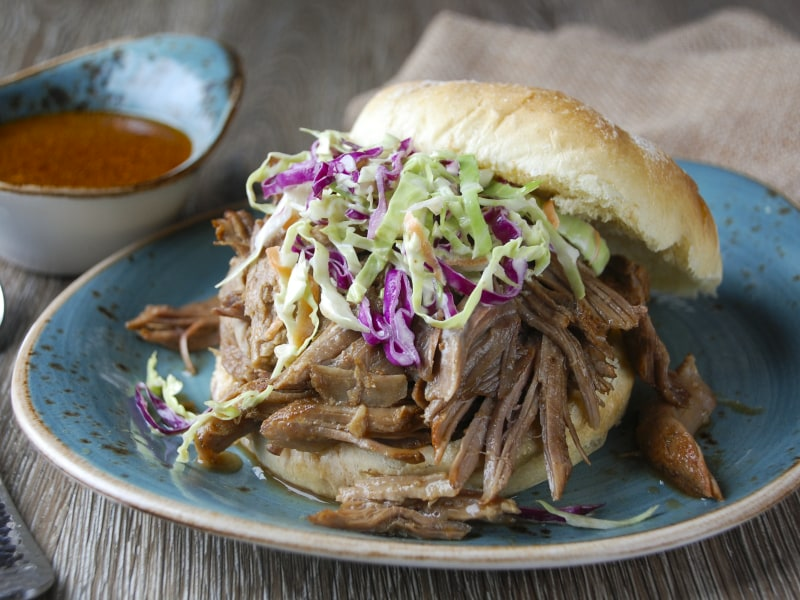 We smile pulled pork all the time but this pressure cooker recipe gets it pretty close to that and saves me hours. I added a small amount of liquid smoke to the pot too. BBQ is a huge staple in my house so this was spot on. I went with a cup of cold brewed coffee instead of beer to intensify the flavor. For the spice rub I added in some minced onion and cayenne. I made pulled pork nachos, they were really good in this recipe. Didn't need to make the coleslaw. It had all of the flavors I like, for example, brown sugar and ACV. I put this in with an hour delayed start - just dumped the spices and liquids all together, set the delayed start for an hour, left for church, and came home to yummy smells! The pork was incredibly tender (I used a picnic shoulder) and the flavor was wonderful! I made this yesterday for my daughter in laws family that was visiting from Tijuana, Mexico. My pork shoulder was 5.23 lbs and everyone had seconds!! I followed the recipe exactly since it was my first time but the next time, I am adding more spices and not as much liquid. There is just enough leftover for two sandwiches tomorrow!! Simple and tasty recipe! I cooked only the pork portion and after shredding it, froze it for a party next week. (But I did sample it to ensure it was delic before serving to my guests.) I was even able to make this while my 2 (toddler aged) kids were awake! I usually cook when they’re asleep if something is involved, so I know it’s an easy one! This is my new party staple. This was awesome! I had to buy two roasts and in some air headed moment ended up with one beef and one pork. I said screw it and threw them both in ... the beef of course ended up well done but both were delicious. This was the first thing I made in my instant pot and i was so excited. This was awesome! I skipped making the slaw because I didn’t have the ingredients but it didn’t matter. It was melt in you mouth good and the spices perfect. This was an easy recipe and I would absolutely make it again. I was in a hurry and looked up this recipe more for reference points than ingredients. I had 8 lbs pork which filled to the PC Max line. Delicious. Next time will make time to follow the recipe. It sounds great! This recipe turned out so good and was so easy to make. I used country style ribs because I could not find a boneless shoulder that was big enough. Also, I ended up with more broth than I needed. The recipe was a hit with the family.